The latest volume of the prestigious anthology series, published annually across six decades! The Nebula Awards Showcase volumes have been published annually since 1966, reprinting the winning and nominated stories in the Nebula Awards, voted on by the members of the Science Fiction & Fantasy Writers of America® . 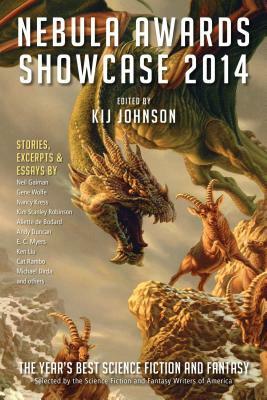 The editor selected by SFWA's anthology committee (chaired by Mike Resnick) is American fantasy writer Kij Johnson, author of three novels and associate director of the Center for the Study of Science Fiction at the University of Kansas. This year's Nebula winners, and expected contributors, are Kim Stanley Robinson, Nancy Kress, Andy Duncan, and Aliette de Bodard, with E.C. Myers winning the Andre Norton Award for Young Adult Science Fiction and Fantasy Book. Kij Johnson is an American writer of fantasy and the author of three novels and more than thirty short works of fiction. She has worked as managing editor for Tor Books and TSR (later Wizards of the Coast), collections editor for Dark Horse Comics, and content manager working on the Microsoft Reader. She is an associate director for the Center for the Study of Science Fiction at the University of Kansas, and serves as a final judge for the Theodore Sturgeon Memorial Award.